The first promotional video of Kuru, Tetsuya Nakashima’s first foray into horror films, has been made public through different Japanese media. Lords of Chaos The new film by the director of The World of Kanako and Confessions will be released in Japanese theaters on December 7. Kuru will be the real-life adaptation of the horror novel Bogiwan ga Kurude Ichi Sawamura and which was released in 2015. 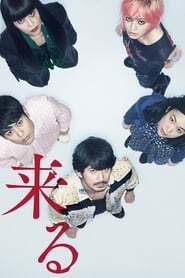 The story is starring a young woman played by Nana Komatsu (The World of Kanako, Silence) who feels harassed by the presence of a spirit or ghost around him. The Happy Prince To get rid of her, she will have the help of her boyfriend Junichi Okada (Hana). The rest of the cast is completed by Satoshi Wonder Woman Tsumabuki (A family from Tokyo), Haru Kuroki (The red roof house, Wolf Children) and Takako Matsu (Confessions).